Earlier this year, my wife and I had the privilege of visiting the beautiful country of New Zealand. We first landed at Christchurch where Teddy, Anzed Rentals' owner, lent us one of his cars. His service was superb and he was very kind and personable. For the first 10 days, we toured around the picturesque South, right-hand driving 2500 kilometers in total. After that, we spent the next 8 days with my sister and her family in the North Island. In NZ, however, if you have the “right of way”, you can confidently proceed, knowing that the other vehicle approaching your lane would give way. 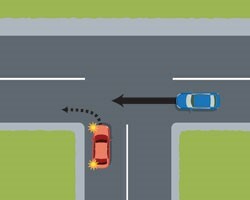 In the picture, the red car gives way to the blue car. My problem was, having grown so accustomed to Manila driving, I’d cautiously slow down whenever I see another car approaching my lane even if I had the right of way, fearing that the other car would cut me off (like in Manila) and we’d collide. The thing is, I wasn’t supposed to slow down because apparently, people over there follow road rules. You can just imagine how many times I got honked by the cars behind us on our first day for slowing down. Bad habits are formed through repetition over a long period of time and you tend to bring your bad habits with you wherever you go. When you’ve gotten used to doing things the wrong way, it takes time and effort to start doing things the right way. It takes time and effort to replace your bad habits with good ones. It’s the same thing with sin and your relationship with God. When you allow “living in sin” to be the norm in your life, God’s righteousness will become so strange for you. God's ways will be hard for you to accept or handle. It will be hard for you to live out God's values. You’ll become so skeptical of God's plan. It’s like stepping on quick sand, the longer you stay there, the deeper you’ll sink. Driving in NZ felt really good after a while, the same way that living uprightly through the enabling power of Christ can give you so much freedom and joy once you've gotten used to it. Is there anything you need to stop doing right now?